Ses Petite Mains is BACK!!! 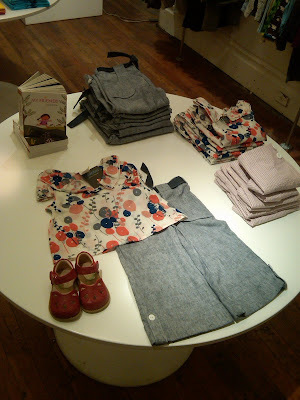 We just got our Spring delivery in from Ses Petite Mains, and it's FANTASTIC!!!! Whew, have we been missing her collection or what! Unfortunately Beth did not produce a Fall collection and Fiddlesticks was feeling it's gap for sure. But, they're back. And it's beautiful!! And colorful, and whimsical...just as always! Take a peek. In welcoming Ses Petite Mains back into Fiddlesticks, we thought we would celebrate with a little Q&A from Beth. ses petites mains spring10 is rich in 30’s/40’s sentiment--a loving nod to my mother Eileen, who grew up in the 30’s and taught me so much of what I know about design today. The muted colors, the fabrics (linens, seersuckers, denim) and the shapes all take me back to our wonderful family archive of photos from that time, of which I am constantly digging through and finding rich inspiration. One of my favorite styles is the Bailey Trouser, the ease of the leg, the deep pockets and the cuff detail. 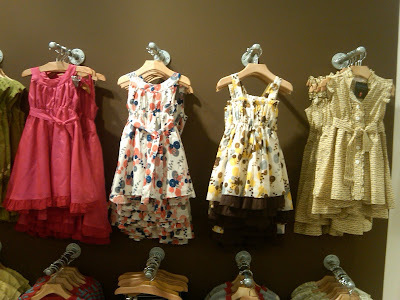 And the shirtwaist dresses, always a favorite of mine and so sweet on little girls. what would be your advice to women interested in becoming an entrepreneur? Be really prepared to work! I have never worked so hard. Although I have more flexibility with my hours, which means a great deal to me, as I can stay close to my family, there are many nights when I don’t get my eight hours of sleep! And my most important bit of advice, get ready--never give up on your vision! If you believe that you can create something meaningful, don’t let anyone tell you otherwise. I think that stubborn belief in myself has allowed me to get through the sticky parts of running a small business. And there are always sticky parts—late fabric deliveries, pattern mishaps, etc. My ‘real’ job is to manage the problems and come up with feasible solutions. And I do think that being a mother gives me an advantage. In my past life, I would have mulled over things much longer, and now I have to make decisions because my time is not always my own. 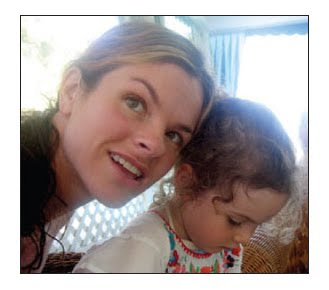 Motherhood has made me much more efficient and sharper, so I have my lovely daughter to thank for that! Our farmer’s market in Noe Valley on a Saturday morning—listening to the music, getting honey sticks and hanging out; flying kites at Rodeo Beach in Sausalito, hiking along the headlands, the tide pools at Muir Beach, eating cheese toasties at the Pelican Inn. 4. What have you found to be your biggest challenge as a designer? Continuing to manufacture my line here in San Francisco--the economy has made everything harder but I really believe in keeping our production local and supporting the community in which I live. It just makes me work harder to keep my costs in line with the brands that produce off shore and don’t have the same labor costs as ses petites mains. now, what would we find? She is her mother’s daughter for sure! I love shoes and she is following suit—bloch metallic ballet slippers; red polka dot flamenco shoes; her tap shoes (she’s obsessed), way too many pairs of outgrown-ballet slippers; a pair of hotel slippers from a recent holiday; snow boots with fur tops, sequined flip flops and red converse low tops, sparkly fuscia maryjanes, and her white and pink cowgirl boots. 6. If you could dress a famous actor/actress - who would it be & why? Someone like Rachel McAdams…I think she has such a wonderful retro appeal about her, she's very stylish and doesn’t always appear so ‘slick’ which I appreciate. There are so many young actors who look sophisticated in a way that takes away from their own sense of style. They end up looking a bit too manufactured, slightly boring in doing so. I love that she will streak her hair with pink and wear youthful,spirited clothing. We could have fun putting together a look, I’m sure.